Elotto is a bit of curiosity. They are mainly a results checking service aimed at Irish syndicates, but can also manage ticket buying for you too. So this is not really a syndicate as such, but more of a service aimed at making life easier for those already managing or wanting to run their own groups. It's important to point out again that this service is aimed at people living in Ireland. So the games they cover are the Irish Lotto games (Lotto, Plus 1, Plus 2), EuroMillions and EuroMillion Plus. But other countries are not excluded, so you could also use this service if you are outside Ireland. The main service is results checking. You enter all of your numbers, up to a maximum of 80 combinations, together with the dates they are being played. And can then login after the draws to see how you did. 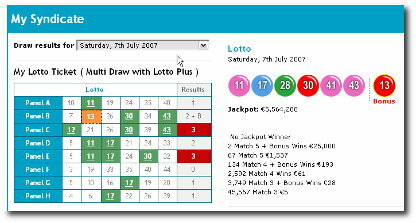 Tickets and results are clearly laid out, your matched numbers are highlighted on your tickets alongside the results from the draw. You can also see what the prize payout is for that draw at each prize level. You can also enter all your syndicate members names, and provide them with a 'read only' login - so they too can see the results, but without being able to change anything of course. Which is useful. There is also some provision for tracking that your members have paid you. This basic service costs €20 per year, and you can join online and pay by credit card. But there is also a 30 day free trial so you can also check the service out before you pay anything. This secondary element of the Elotto service is a bit more tucked away, and seems almost reluctantly provided. But they can also buy tickets for your group. Firstly you have to request a 'Play Pack' be sent to you. This includes a registration form which you'll need to print out, complete, and sign along with the terms and conditions. Then get copies of a photo ID and utility bill, and post this lot to Elotto. Then you'll be sent playslips. Which then also have to be completed, signed and returned. Once you make it through the sign-up process, you'll be charged 4 weekly in advance. Then your tickets will be bought, scanned and emailed to you before each play. Prizes are claimed for you by Elotto and paid out to your bank account or credit card. There is of course a fee for providing this service as you would expect. The price is €5 per 4 week period for each playslip you submit (up to 8 combinations per playslip for Lotto and 5 for EuroMillions). But there is a bit of a 'gotcha' here too - they also take a percentage of your winnings..! To the amount of 5% of each win up to €25,000, reducing to 1% for wins larger than that. You do get the results service for free though if you use the ticket buying. If you run your own group, then you may find the €20 a year service a small price to pay for a quick and easy way to check your results. And the syndicate management features whilst pretty basic are useful if you have no other system in place. You would of course be relying on a 3rd party for results, even though I'm sure they do their utmost to ensure the results are correct. But it's always wise to check your tickets against two different sources anyway, as publishing errors do happen on rare occasions even with official sources. On the ticket buying side, it's certain useful to have someone handle this for you as well as the prize claims. And the price is not unreasonable for the effort that requires. But personally I really don't think they sould be taking any share in the winnings of groups on top of this fee. <<< Back to the Irish Lottery Syndicates. Wintrillions Irish Syndicate - decent Irish option from ticket buying company that's been around since 2006. 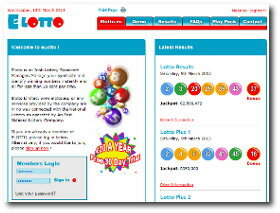 Big Fat Lotteries - options for Irish Lotto, EuroMillions and more from this well established pro company. Love My Lotto - lots of draws rather than lots of tickets, but covers UK Lotto, Plus 5, EuroMillions and more. You Play We Play - straightforward UK and EuroMillions options, with a useful pay only when you want to play feature.